Since it came into force on 31 January 1997 the Arbitration Act 1996 has generally been welcomed by users and practitioners in the construction industry. It has fulfilled expectations that it would provide a user-friendly and practical basis of resolving disputes arising from construction contracts in a fair, expeditious and economical way. In doing so it has generated a modest volume of case law that has demonstrated the excellence of the Act's provisions and its drafting. 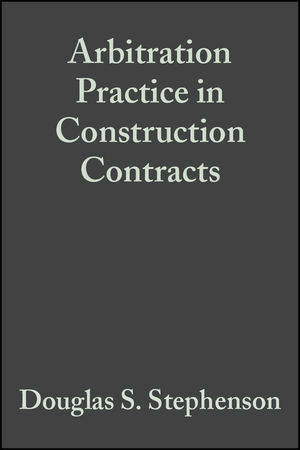 Since the Fourth Edition of this book appeared in 1997 the Housing Grants, Construction and Regeneration Act 1996 with its Scheme for Construction Contracts Regulations 1998 have come into force, as have the Civil Procedure Rules 1998, both of which affect the resolution of disputes arising from construction contracts. Case law has arisen from the Construction Act, and from the House of Lords' judgment in the Beaufort Developments case, overturning the much-criticised judgment of the Court of Appeal in Crouch. In this Fifth Edition of an established text the author deals with each stage of an arbitration, explaining in practical terms the procedures to be adopted in avoiding disputes and in dealing with them efficiently when they do arise. It features over 20 specimen arbitration documents and includes the full text of the Act. It also covers several important developments in case law affecting construction arbitrations, and refers to the introduction and case law arising from adjudication under the Housing Grants, Construction and Regeneration Act 1996. Douglas Stephenson BSc. FICE, FIStructE, FCIArb, MConsE spent the first 25 years of his engineering career in the design and construction of a wide variety of civil engineering works. In the early 1970s he established his won practice as a consulting engineer, specializing in dispute resolution, as arbitrators and of the Society of Society of Construction Law. 3. Appointment of the Arbitrator. 4. Jurisdiction of the Arbitrator. 10. Powers of the Court in Relation to the Award. 11. Dispute Avoidance and Management. B. The Arbitration Act 1996. C. The Arbitration Act 1950: Part II. D. The Scheme for Construction Contracts (England and Wales) Regulations 1998. E. The Unfair Terms in Consumer Contracts Regulations 1999. F. The Unfair Arbitration Agreements (Specified Amount) Order 1999. "The fact that this book, by a respected and highly experienced engineer and arbitrator and first published in 1982, has now reached its fifth edition is in itself a tribute to its quality. It is an excellent short guide to a complex subject, written in clear English..."